Brittany Franklin wasn’t expecting a diagnosis of ulcerative colitis (UC) at the age of 22. She was just embarking on her adult life, looking forward to a bright future. But when intestinal problems landed her at Barnes-Jewish Hospital, she had to confront a new health reality. UC is an inflammatory bowel disease (IBD) that creates sores in the wall of the large intestine. Doctors aren’t sure what causes UC, a type of autoimmune condition, says Washington University gastroenterologist Dr. Matthew Ciorba. The main symptoms include serious abdominal pain, cramping and diarrhea that is sometimes bloody. The condition’s psychological and social effects can be just as tough to handle as its physical ones, he says. Patients worry about flare-ups, and often feel they have to stay at home or keep close to a restroom at all times. Ciorba says as many as 3 million Americans have IBD, a category that also includes Crohn’s disease. Crohn’s can cause inflammation, ulcers and bleeding anywhere along the gastrointestinal tract, whereas UC is limited to the large intestine. Both diseases show up most often in the late teens and early 20s, Ciorba notes, but they can appear later in life as well. Because they are linked to increased colon cancer risk, it’s important to see a doctor if symptoms appear. When IBD patients come in, the Washington University team runs thorough diagnostic tests and creates a personal treatment, diet and lifestyle plan to keep symptoms under control, Ciorba says. IBD patients also have access to a gastrointestinal-health psychologist and nutritional counseling. Washington University Physicians offers comprehensive and compassionate care for patients with IBD. They can be seen at three St. Louis-area locations and work with multidisciplinary experts who provide whole-patient care. Pictured on the cover: Dr. Matthew Ciorba with a patient. For more information, call 314.747.IBD6 (4236) or visit gastro.wustl.edu/IBD. 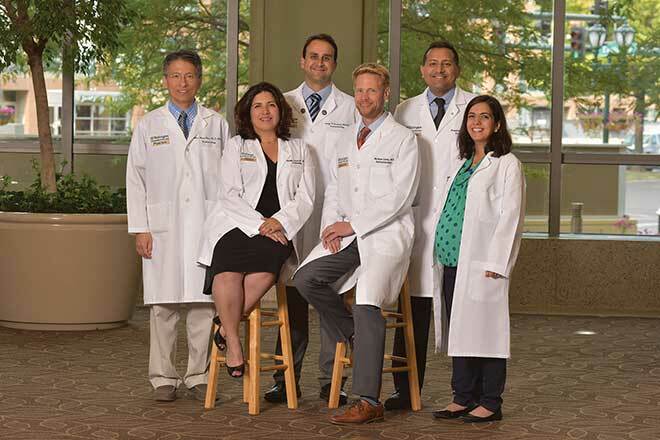 Pictured at top: Washington University IBD specialists Chien-Huan Chen, M.D., Ph.D.; Alexandra Gutierrez, M.D., MPH; George Christophi, M.D., Ph.D.; Matthew Ciorba, M.D. ; Parakkal Deepak, MBBS, MS; Cynthia Cherfane, M.D. UC is an inflammatory bowel disease (IBD) that creates sores in the wall of the large intestine. Doctors aren’t sure what causes UC, a type of autoimmune condition, says Washington University gastroenterologist Dr. Matthew Ciorba.